We should remind ourselves that from the moment that peoples first landed in the Hawaiian islands until the 1930s we were food self-sufficient. Today, we import about 90-95percent of our food. Our dependence on oil to transport our food longer and longer distances, and on oil-based fertilizers that fuel industrial agriculture, seems to be coming to a halt. What will replace this fossil-fuel dependent, industrial model that has degraded soils and farming communities worldwide? There is another vision. Land reform at the state and county level can create affordable opportunities for interested farmers to live and farm long-term on a piece of land. We need to keep our best agricultural lands zoned for agriculture and continue to develop water infrastructure. Our institutions can develop educational programs that actually train young people and mid-career changers to farm in the tropics. Counties can work with farmers to recycle the communities’ organic waste, which will increase soil health and farm profitability. The Cooperative Extension Services can offer non-toxic solutions to pests and disease and assist communities with knowledge for developing community and home gardens. The University of Hawai‘i can develop open-pollinated seed varieties of both fruits and vegetables adapted to our tropical environment. Our Rural Economic Development Boards can support direct marketing of agricultural products such as farmers markets, CSAs (community supported agriculture), and schools can purchase fresh produce from local farms. Supermarkets can buy local produce, and restaurants can feature fresh foods from area farms for the visitor and local alike. Working together, these programs form a new vision of agriculture, a vision that is gathering interest locally and already growing in many areas of the U.S. and elsewhere in the world. Perhaps the most compelling aspect of the sustainable food movement is how quickly a community can create a local food economy. It doesn’t take global agreements and it doesn’t require new legislation. Each time we buy food from a local farmer who grows in ways that respect the land, we are voting for a safer, economically vibrant and more delicious food system and way of life in Hawai‘i. We have incredible potential here with our vigorous year round growing environment. We can grow valuable high-end tropical fruits, nuts, vegetables, and flowers for specialty markets. We can feed our families and our communities. We can focus on diversified niche markets and value added farm products. We can assist our farmers to procure small grants for value-added processing machinery, and development of business plans. We can be the center of tropical agricultural research and program application for farmers in the tropical countries of the world! 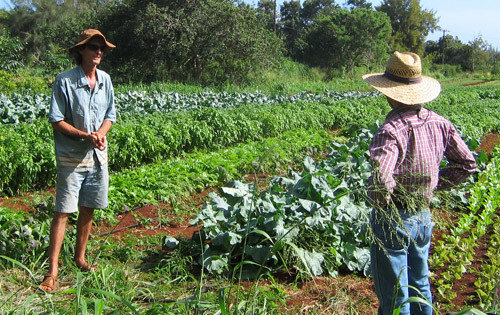 Instead of using our land as a laboratory, we can connect to the ancient sustainable and profitable farming systems that have been practiced here in Hawai‘i and on planet Earth for 10,000 years. We can demand that our institutions be responsive and responsible to our communities and land, rebalancing our farming systems in the ecological/sustainable ways of the future.